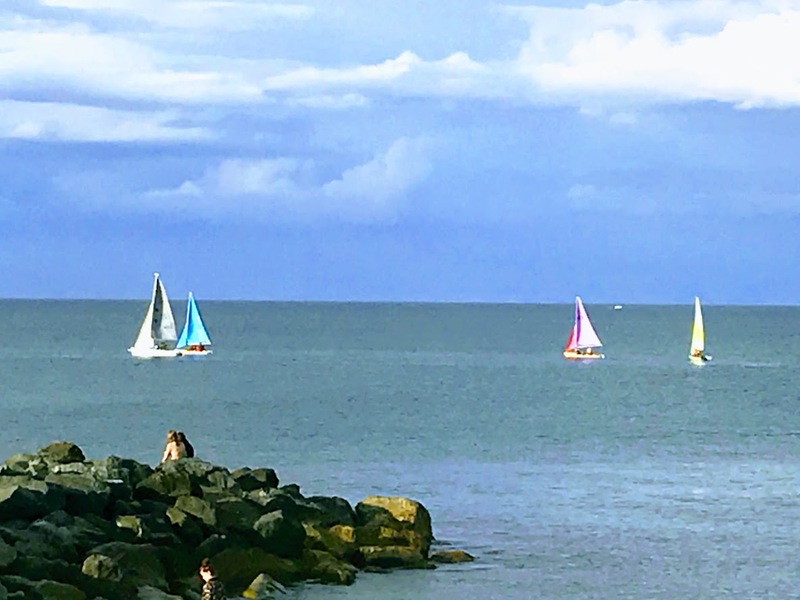 Bray was planned in the Victorian decades as the ‘Brighton of Ireland.’ So, it is only to be expected that it should be at its best on a sunny summer evening in August. 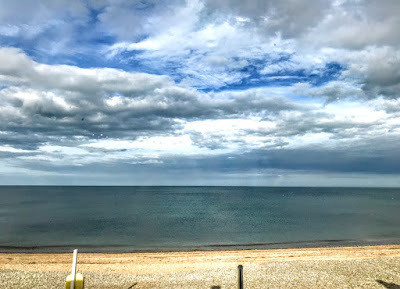 The August bank holiday weekend was over, and they were taking down the last of the funfair rides on the seafront when four of us arrived late in the afternoon with plans for an evening meal to celebrate a family milestone. Looking up towards Bray Head, there were no signs of the recent fire that had devastated part of this place of natural beauty just a few weekends ago. 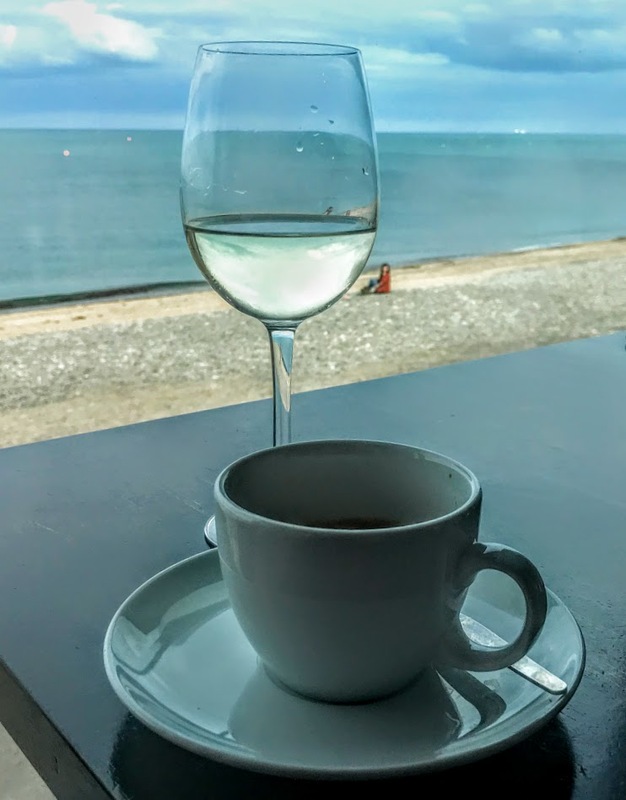 For some years now, Carpe Diem has been my favourite restaurant and wine bar in Bray. But it closes on Tuesdays, and instead we opted to have dinner in Butler and Barry, the gastropub on Sea Road, above Sealife. Many years ago, this was the Beach House, and I had many enjoyable dinners there on summer evenings, including one memorable evening when we watched dolphins dancing and playing in the sea. We had no booking on what seemed like a busy summer evening [7 August 2018], yet we were warmly welcomed and given a table by a large window looking out on the beach and to the Irish Sea. There were no dolphins in the sea yesterday. Instead we had a perfect view of an evening’s sailing that entertained us throughout dinner. 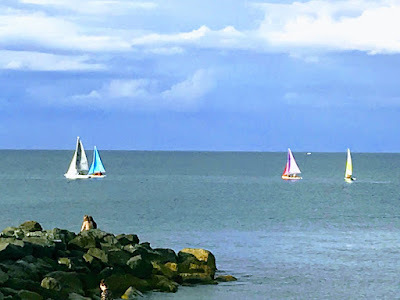 After double espressos, there was still an invitation in the evening sunlight to walk along the seafront and enjoy authentic Italian ice creams. I recalled stories of how an aunt and cousins had lived in Bray for many decades, how this was the town where my parents first lived after they married in September 1945 at the end of World War II, how in my early teens Bray was a fun destination for a day out, and how the Bray People was one of the provincial newspapers I had worked for as a journalist in my early 20s, designed the front page and editing the sports pages. Hopefully, Bray will bring its own joys and pleasures to future generations.